The European Union offered Britain a choice of short delays to its departure from the EU, postponing Brexit, due March 29, until at least mid-April. After hours of talks, the leaders decided that Britain’s exit date will be pushed back to May 22 if next week May can persuade lawmakers in Parliament to accept her plan for leaving the bloc, which they have already rejected overwhelmingly, twice. If she cannot persuade lawmakers to accept her plan, May will get a shorter delay in exiting the EU — until April 12. But Britain could stay in the bloc much longer if it decides it needs more time for a bigger rethink of Brexit, as the process is known. If so, it would have to take part in elections to the European Parliament in May. Thursday’s decision on extending the deadline was made by the leaders of 27 nations of the EU, without May. But she agreed to the decision. And while May insists she can muster the votes to ram her deal through in a third vote, her continental colleagues have largely lost faith in her ability to deliver on Brexit. Her plan would eventually give Britain power over immigration from Europe, but tie the country to the EU’s customs and trade system until at least the end of 2020. 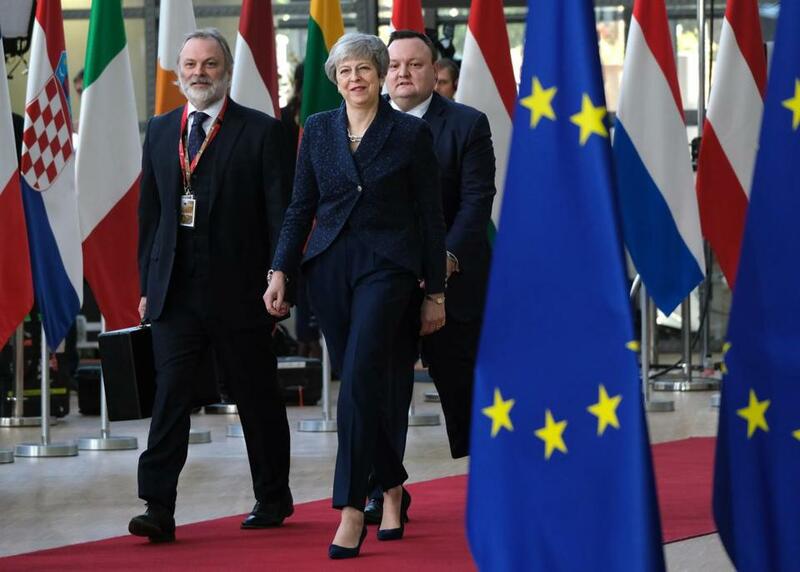 Arriving at the EU meeting in Brussels, May refused to exclude the possibility of leaving the bloc without a deal if she cannot get her plan through Parliament next week. “Our country is facing a national emergency,” the main British business and trade union groupings, the Confederation of British Industry and the Trades Union Congress, said in a rare joint statement. In Brussels on Thursday, European officials also were host to talks with Jeremy Corbyn, the leader of the opposition Labour Party, which wants closer ties to the EU than do May’s Conservatives and could play a critical role in the way things unfold in London. If May, against the odds, does succeed in Parliament next week, then matters move relatively smoothly, with a modest delay to Brexit to allow for enacting legislation to put her plan in place. May, though, has been hinting that she might prefer a no-deal Brexit, even if that outcome was opposed overwhelmingly in Parliament. Britain has the power to withdraw its decision to leave the bloc — as opposed to requesting an extension of negotiations — and could do that unilaterally. Yet it is almost impossible to imagine May doing this, since she has vowed to deliver Brexit one way or another. That has prompted speculation that, if May loses again next week, she could face a leadership crisis, particularly if she tries to pursue a no-deal Brexit. But it would be hard to force her out, even if more pro-European Cabinet ministers threatened to quit. “We need to be prepared for everything, but of course we will do everything to find a solution,” Grybauskaite said.